Important: This option is part of the Multi-Year module. See Adding Modules for more information on purchasing modules. The Multi-Year module allows you to model changes that occur over the lifetime of the project. It does this by running a simulation for every year in the project life. Without the Multi-Year feature, HOMER runs a single simulation and extrapolates the results over the rest of the project lifetime. Multi-Year mode significantly increases the calculation time, but allows you to model some important phenomena that can't be captured in a single year simulation. •Component degradation: Photovoltaics panels degrade over time. Battery degradation can also be modeled when the Multi-Year module is combined with the Advanced Storage Module. and with 3.10 you can also model degradation for the custom component. •Price fluctuations: Prices of fuel, the grid, and other components might not stay the same over the course of a project. The Multi-Year module allows you to input anticipated percentage changes in diesel prices or grid prices year by year. •Load growth: The primary demand might increase or decrease over the project lifetime. The Multi-Year module allows you to input a year-by-year percentage change in the load. •Other costs: You can set a value for the System Fixed O&M Cost, then use the Multi-Year multipliers to add a custom cash flow profile to the economics calculations. 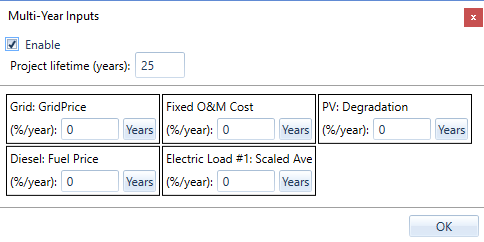 Tip: Battery degradation is modeled automatically if you include a battery using the Modified Kinetic Battery model and enable the Multi-Year module. Note: The Multi-Year module does not work with the HOMER Optimizer. To use the Multi-Year module, click the Project tab on the HOMER toolbar. Click the Multi-Year button to open the Multi-Year Inputs pop-up window. The variables that appear depend on your formulated system. Check the Enable box to enable this module. Enter the number of years for the project's duration in the Project lifetime (years): box. You can then choose to include the fluctuations in the Grid Price, O&M Cost, PV Degradation, Diesel Fuel Prices, and primary Electric Load, as described below. If you do not want to model changes in a certain variable over the project lifetime, leave the change rate (%/year) at zero. You can set either a constant percentage or a percentage for each year individually. To set a constant percentage by which a component can change every year, enter the percentage number in the box for the variable. To modify the relative value of the variable for each year individually, click the Years button. The Multi-Year Variable Details table appears in a pop-up window. When you first open the year-by-year table, the multipliers are calculated based on the percentage entered in the change rate (%/year) box. Make your changes and click OK. Note: The calculation takes longer using the Multi-Year module. The calculation time is increased over the normal calculation by a factor of the number of years in the project lifetime, and significant extra overhead associated with the Multi-Year calculations. When you use the Multi-Year module, make your Search Space and sensitivity analysis small.